Hello Chiefs Nations! Welcome back to the newest edition of Top Free Agents of 2013. Today we have a special treat. Linebackers (LB) are the focus of today’s post. If you have followed any of my previous articles about free agents, then you know that first, I will talk about current LB’s on the roster. I will then move onto the top 5 LB’s that will hit the FA market, then I will move on to discuss 5 LB’s in this years draft and focus on the ones that have a legitimate shot at being drafted by Reid & Co. The official 2012/2013 season will end on March 12, 2013 at 4:00pm, when all current 2012 contracts expire. I think when the Chiefs address the LB position in the draft, it will happen somewhere between rounds 3 and 5. There will be many good collegiate players in the draft this year, but which ones fit the Chiefs the best? A pass rushing LB? A good coverage LB? A beefy hole filling LB? These questions will be answered and addressed. The Chiefs are very well set with 3 of their 4 starting LBs. Justin Houston, Tamba Hali, and Derrick Johnson are all big time play makers and can cause chaos over the middle (i.e. D. Johnson) of the field, or cause havoc on opposing defensive lines (like Houston and Hali do), making a QB run in terror, resulting in a sack, fumble or poorly thrown ball which in turn can be intercepted. 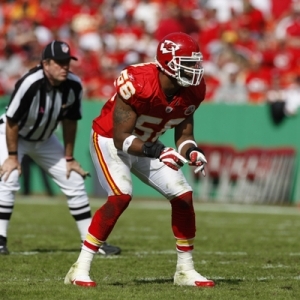 Derrick Johnson and Justin Houston are two of Kansas City’s linebackers that made the Pro Bowl in 2013. Along with them was SS Eric Berry, Jamaal Charles and Dustin Colquitt. Even though only a 2 – 14 team, they had 6 Pro Bowlers. Derrick Johnson is the featured MLB. He has the athletic ability to run the field with any TE, RB, or FB, and can pick up wideouts running routes across the middle ot the field. He is consistent in coverage, and playing the run. An all around LB that can do it all. He has secured his position for years to come. Derrick had 110 solo tackles, 4 forced fumbles, and 2.0 sacks in 2012. Justin Houston had a breakout season last year and surprised many people. He played exceptionally well and has earned his starting spot for years to come . He had 53 solo tackles to go along with 10 sacks in 2012. Not too shabby. Tamba Hali had a down year in 2012 compared to 2010 and 2011. He managed 43 solo tackles and 9.0 sacks in 2012, whereas he had 14.5 sacks in 2010 and 12.0 in 2011, respectively. No matter, Tamba is still the guy every QB wants to avoid when facing the Chiefs. Some of these LB’s will not be re-signed by their current club due to age, unreasonable contract negotiations or the club just wants to move on without them, looking for a valued replacement elsewhere. Dannell Ellerbe – BAL: According to multiple outlets, Dannell verbally announced that he wants to stay in Baltimore. With the exiting of Ray Lewis, Dannell may get his wish. Although he understands that the decision isn’t up to him. He finished out the season with 69 solo tackles, 4.5 sacks and 2 forced fumbles. Brian Urlacher – CHI: Brian will be 35 before the next season starts. Currently, no status has been set whether he will get an offer to re-sign. He had 53 solo tackles, 2 forced fumbles, and 1 INT for a TD in 2012. He is still playing with intensity and is still a good defensive leader. The idea of Urlacher going to the Chiefs for a year or two, is really far fetched. He probably wants to start, which he could next to DJ, but the Chiefs will probably draft a cheaper and younger rookie. As he prepares for free agency for the first time, a healthy Brian Urlacher says he “for sure” wants to play a 14th season, and he hopes that will be with the Chicago Bears. Brad Jones – GB: The former Colorado Buffalo is set to become a free agent this off season. He is 26 years young, and notched in 56 solo tackles and 2 sacks in 2012. He would fit nicely in KC next to Derrick Johnson, as he proved himself in 2012 as being capable. field with the helmet radio transmitter. Credited with 101 tackles and two sacks in 828 snaps but was also charged with 11 missed tackles by ProFootballFocus.com. Unrestricted free agent whom the team would like to re-sign. Erin Henderson – MIN: A 5-year veteran set to be a free agent in March, Erin will be seeking affiliation with a new team unless the Vikings offer him a reasonable contract. He had 50 solo tackles, 3.0 sacks, and 1 forced fumble in 2012. The Minnesota Vikings have indicated that they are interested in re-signing impending free-agent LB Erin Henderson, Jasper Brinkley and Marvin Mitchell this off season. The team is also expected to look at other available linebackers during free agency. Anthony Spencer – DAL: Anthony is a 6-year veteran whom is coming off his best season in 2012. He registered 55 solo tackles, 11.0 sacks, and 2 forced fumbles. Having this guy in KC would bring the Chiefs LB corp. to a new level. This would make them the best LB group in the league. By the way it sounds, Spencer would like to stay in Dallas. While a few NFC East players have made more money than him, nobody in the division has earned more money for the future this season than Anthony Spencer of the Dallas Cowboys. sacks with two of them in the final two weeks. He’s also brought steady pressure in general and has been the best run defender on the team, and one of the best in the entire league. So will he return to the Cowboys in 2013? The impending free agent will be in extremely high demand if he hits the open market in March, so the Cowboys will have to dish out big bucks to keep him in Dallas. Hopefully the Chiefs will take a look at one or two of these guys if they do hit the free agent market. Brandon Siler is currently the other MLB, and either of these guys could be an upgrade. Now let’s take a look at some of the collegiate LBs that are projected to go in rounds 3 through 5. I am fairly confident the Chiefs may draft a LB somewhere in the middle rounds. 2/1/13: Reddick was a disappointment in the early going of 2012, but played better in the second half of the season. He racked up 85 tackles, 18.5 tackles for a loss, 6.5 sacks, two forced fumbles and six passes breakup this year. Reddick may be best in the NFL as part of a 3-4 that likes to blitz from the inside linebackers. 2/1/13: Alonso had an impressive senior season, which he definitely needed. He recorded 81 tackles, 14 tackles for a loss, four interceptions, one sack, two passes broken up and two forced fumbles. Alonso finished 2011 with 46 tackles, two interceptions and two sacks. He didn’t play in his previous three seasons at Oregon. 2/1/13: Bostic had 68 tackles, two interceptions, one forced fumble and three sacks in 2012. He flashed some for the Gators and was a core player in their tough defense. Bostic is much improved over his junior season. 2/1/13: Johnson played decently in 2012 and racked up 55 tackles and two forced fumbles. He had zero sacks and interceptions. Johnson is a good run-stuffing linebacker, but struggles in pass defense. He did not look good at the Senior Bowl; he plays slowly. The Alabama defense is loaded with NFL talent and Johnson is overshadowed. However, he is still a solid pro prospect. 2/1/13: Klein managed 117 tackles, 3.5 tackles for a loss, one sack, one pass broken up and an interception returned 87 yards for a touchdown in 2012. He had 116 tackles, 7.5 tackles for a loss, six passes broken up, two sacks and an interception in 2011. Looking over the potential free agents and rookies, I have 2 players from each category that would fit the Chiefs system, and improve the starting position. Since the Chiefs run the 3 – 4, these picks will be filling the void left by the late Jovan Belcher. My first free agent selection is Brad Jones of GB. He came on strong in 2012 in a times of need and showed the Packers that he can be a defensive leader and get the job done. My second free agent pick would be Anthony Spencer. He would provide the Chiefs with the most dangerous set of linebackers in the league. A QBs worst nightmare. My first draft pick would for an ILB would come in round 3 (Although K-State ILB Arthur Brown is enticing in round 2), and I would take Kevin Reddick of N.C. He can effectively rush the passer from the inside, getting through the O-line, which would be a nice addition. He seems to have the tools to be quality starter in the NFL. My next choice would be A.J. Klein. He really seemed to be a tackler in 2012. With solo and assisted tackles combined, he was good for 117. Pretty high number. Not sure how he would translate to the NFL, but if his tackle counts says anything about him, it definitely means he’s not afraid to get in the way of the ball carrier to make the stop. So in this edition of Top Free Agents of 2013, we have addressed 5 soon-to-be free agents, and have taken a brief glimpse at 5 potential draft prospects. Tell us Chiefs Nation, what is your opinion on the need for an ILB? Do the Chiefs draft an ILB or sign a FA? Both? Share your thoughts with us. Don’t forget to sign-up for our Chiefs360 Contest! You could win a Kansas City Chiefs FATHEAD Helmet! Sign-up Here! Thanks for reading, please like, share, and follow us. Help us make Chiefs360.com THE place for Chiefs news, opinions, and more! Previous articleSuper Bowl 47! SF 49ers vs Baltimore Ravens!